Igniter Media has a new website (it's pretty good) and we have a page. Not sure we appreciate the subtext to our name title. Do people laugh AT us? I didn't think so. Chachi and I got mentioned several times in the Igniter list of things they have learned after completing 100 mini movies. 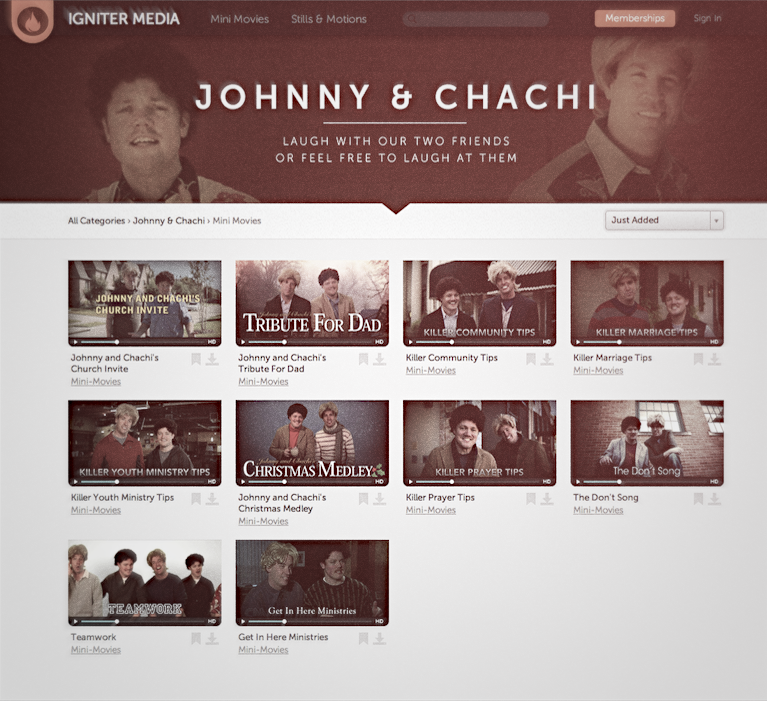 I believe 9 Igniter Media mini movies are 'Johnny and Chachi' ones so I think that means around 45% are ours. (I hate math). Anyhoosier, here's a big fat link to the article. It's on a site called EchoHub, which is a relatively new site for church dorks... I mean creative people. You should check out the whole site when you are having trouble falling asleep. This video is suppose to instruct you on some easy ways to invite your neighbors to church... however Chachi kinda butchered his part. Either way, take a look. A Church Invite video is coming like, real soon. 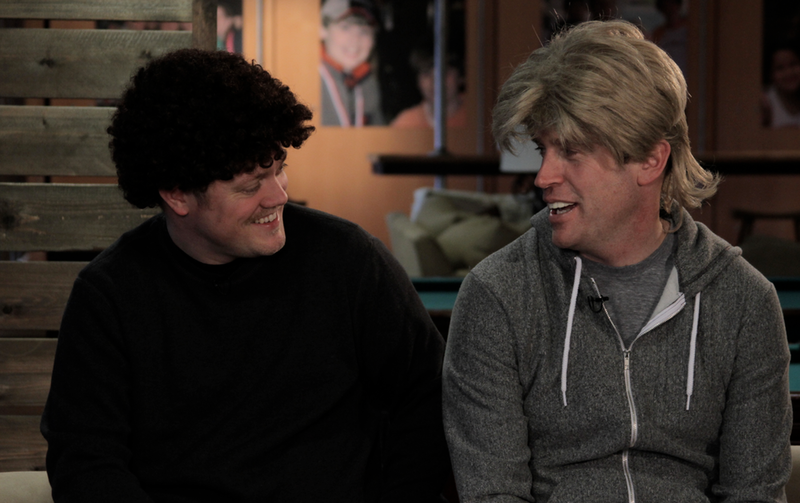 Here we are on the set of our new video, 'Johnny and Chachi's Church Invite'. We live in a world where people need to invite people to their church... and they don't! Why? Maybe because they don't like their church. Maybe because they're scared of rejection, or laughter. Whatever the reason, we are here to give you the encouragement you need to go for it. You may or may not know this, but the Skit Guys love us. So much so that they decided they would put some of our videos on their site. I guess they saw our Facebook fan numbers and thought, 'We HAVE to have these guys'. Now don't go look at our FB numbers... and don't go COMPARING their fan numbers with ours. That wouldn't be prudent. Okay, truth is, Skit Guys are about 1,600x bigger than us and we begged them to have our videos. There! Are you happy? 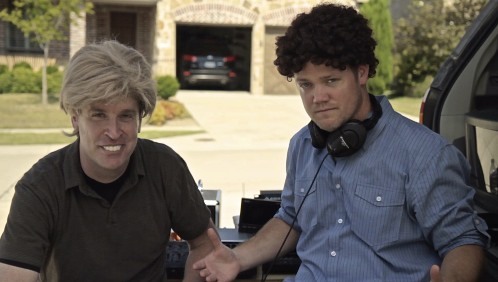 Go check out Johnny and Chachi videos on SKITGUYS.COM and while you're there, check out the great Skit Guys videos. It has been forever since we posted something. Sorry about that 2 fans! We just got done putting together a script for a Father's Day video... we should be shooting next Friday. Can't wait to get back in the saddle again. We haven't done a new video in over a year now! Igniter Media is finally about to update it's stale and outdated website. It wasn't that it was bad... it just made me want to throw-up. Anyway, they have updated it and it looks amazing. There are a ton of new features... go check out their blog to see what they are (just don't read them all at once unless you want a good nap). The new site doesn't launch officially until later this week, but check out the new promo video we did for them.